Nomad Factory is proud to introduce ECHOES, a new Analog Echo Box plug-in designed to give you the warmth and richness of classic vintage delay effects. 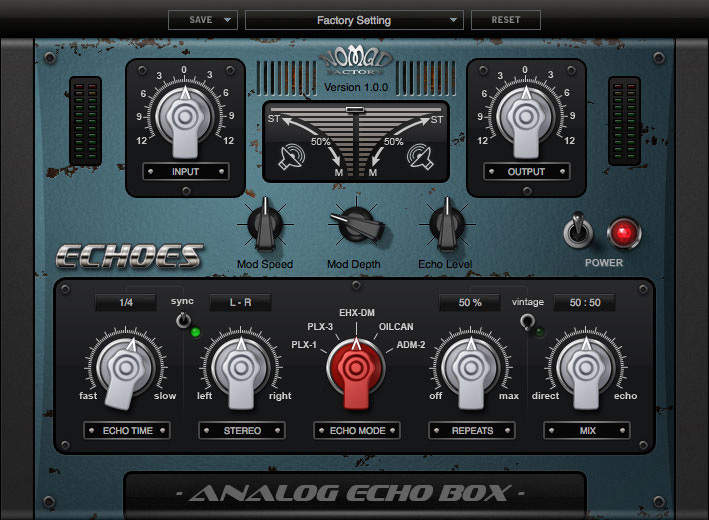 ECHOES is the last word in echo effects, faithfully modeling the greatest delay effects of all time, including the PLX-1 based on* Echoplex® 1, PLX-3 based on Echoplex 3, OILCAN based on Tel-Ray® Oilcan Delay, EHX-DM based on Electro Harmonix® Deluxe Memory Man, and ADM-2 based on Boss® DM-2 Analog Delay. *All Trademarks are property of their respective holders.